Pictures show the newborn osprey chicks. Please click on the image below to download the image. The arrival of a dozen chicks has made 2017 another record breaking year for the Kielder ospreys. Eight years after ospreys returned and began nesting at Kielder Water & Forest Park, the birds continue to be a popular attraction for visitors to Northumberland. 2016 saw a record 11 chicks fledge and, with the hatching of 2017’s 12th new arrival, that is hoped to once more be eclipsed in the coming weeks as the 2017 chicks fledge, and take their first flights. The chicks will now begin building their strength for what is always a challenging first year of life that will include solo migration flights, normally to Africa. 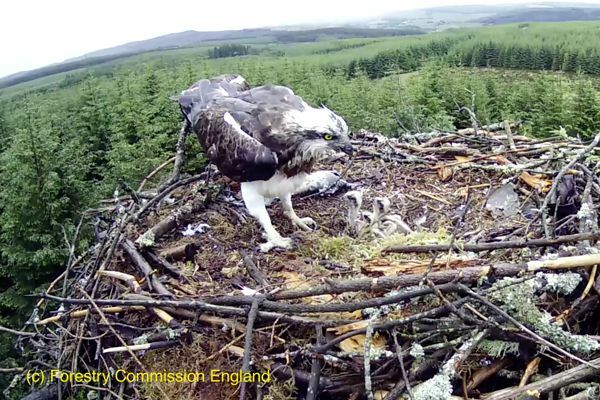 If visitors aren’t fortunate enough to spot of the birds directly, they can tune into the soap opera in the sky via webcams streamed to the Forestry Commission’s Kielder Castle and Northumbrian Water’s Kielder Waterside. Wildlife lovers can keep up to date with the story of the Kielder ospreys as it unfolds through the blog at kielderospreys.wordpress.com. 1. Historically ospreys lived in Northumberland, hunting on the once extensive network of marshes. However, records going back more than 200 years fail to mention any ospreys breeding in the county. Ospreys were once distributed widely, but persecution resulted in the species becoming extinct in England as a breeding bird in 1847 and in Scotland in 1916. Some birds re-colonised in Scotland in 1954 and by 2001 there were nearly 160 breeding pairs (today about 200). The same year saw the first successful osprey nests in England for 160 years by re-colonising birds in the Lake District and re-introduced ones at Rutland Water in the East Midlands. • Ospreys are migratory and arrive in late March and April and leave again for Iberia or Africa in August and September. • The bird is an Amber List species because of its historical decline (due to illegal killing and egg theft) and low breeding numbers. • Ospreys normally breed for the first time when they are aged between 4-5 years old. • They are largely monogamous and faithful both to nest and mate. • The nest is generally built on the top of a large tree. • Females lay two or three eggs at 1-3 day intervals which are incubated for about 38 - 42 days per egg. • Ospreys divide the nesting duties between the pair. The female does most of the incubating, brooding and direct feeding of the young. She guards them throughout the nesting period and will share the hunting at later stages when the chicks are larger. The male is the major provider of fish for the female and chicks. • Chicks fledge about seven weeks after hatching. 3. Kielder Water & Forest Park, which spans 250 square miles, is home to the largest working forest in England and the largest man-made lake in northern Europe. It was awarded the number one tourism experience in England by VisitEngland 2013, and the most tranquil place in England by the Campaign to Protect Rural England. Together with Northumberland National Park, it was granted gold tier Dark Sky Park status in December 2013. For more information see www.visitkielder.com. 4. Kielder Water & Forest Park Development Trust is a registered charity working at Kielder to promote sustainable development, provide recreational facilities, improve knowledge of the natural environment and encourage the arts. The Trust works with the range of communities to benefit from these activities. Members, who have appointed directors/trustees to serve on the board, are Northumbrian Water, Forestry Commission, Calvert Trust Kielder, Kielder Observatory Astronomical Society , Northumberland National Park Authority and Northumberland County Council. Affiliate organisations that are not members but have a close working relationship with KWFPDT include Arts Council England, Northumberland Wildlife Trust, Environment Agency, The Scout Association and local decision making bodies such as the parish councils. 5. Northumberland Wildlife Trust is the largest environmental charity in the region working to safeguard native wildlife. One of 47 Wildlife Trusts across the UK, Northumberland Wildlife Trust has campaigned for nature conservation for over 40 years. It aims to inform, educate and involve people of all ages and backgrounds in protecting their environment in favour of wildlife and conservation. Supported by over 13,000 individual and 56 corporate members in the Region, Northumberland Wildlife Trust manages and protects critical species and habitats at over 60 nature reserves throughout Newcastle, North Tyneside and Northumberland. 6. The Forestry Commission is the government department responsible in England for protecting, expanding and promoting the sustainable management of woods and forests and increasing their value to society and the environment. Forestry makes a real contribution to sustainable development, providing social and environmental benefits arising from planting and managing attractive, as well as productive, woodlands. Further information can be found at www.forestry.gov.uk.